The design of the Wild Boar bumper is unlike any other on the market today. 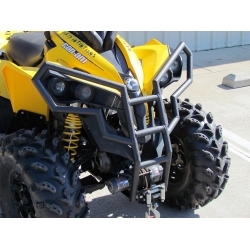 Our bumpers are created to be light weight and extremely durable for your best ATV experience. This bumper has pre-drilled holes to accept a winch. All you have to do is attach the winch to the bumper and you're ready to ride!